Food Costs > How Much Do White Truffles Cost? How Much Do White Truffles Cost? Considered to be a gem in the world of fine dining, this type of subterranean mushroom is known for its savory, sweet aroma with a deep, nutty mushroom flavor with a hint of shallots. Harvested uniquely in Italy from October to December, it’s often consumed raw or as a garnish. On average, a white truffle, when in season, can cost anywhere from $150 to $1,000 per ounce or $2,400 to $6,000+ per pound. These costs will greatly depend on the harvest, the time of year, the size and where you’re purchasing them from. The larger the truffle is, the more it will cost per ounce. Most truffles can only be purchased between October up until January, depending on the supply. Why are they so expensive? Since this is a product that can’t be cultivated or controlled, the prices can be unpredictable, making this delicacy one of the highest priced food in the nation. People, for years, have tried to successfully farm truffles, but no one, to this date, have succeeded. In 2014, for example, a 4.16-pound white truffle had sold for $61,250 to a phone bidder in China. This isn’t the highest price, however. In 2010, a 3.3-pound white truffle was unearthed near Pisa, Italy, and sold for $330,000. According to a MentalFloss.com article, white truffles top the chart at close to $168 per ounce. CNN Money says it’s not too uncommon to see prices inside the $6,000 to $10,000 per pound range, but the costs will vary by the season. Refer to our table below to see what each size may cost per ounce. These costs can greatly vary from one retailer to another and when you plan on purchasing them. On Amazon.com, one retailer sells them by the ounce when in season. According to the pricing history, the costs had ranged anywhere from as little as $138 to more than $265 per ounce. An online retailer we found online, Alma Gourmet, listed its official prices online. According to their prices, it ranged anywhere from $95 for a half ounce to as much as $285 for one ounce. When working with white truffles, a truffle slicer is usually required to produce thick or thin truffle slices with ease. A stainless steel 8.5-inch slicer, for example, can cost about $15 to $35. All white truffles, if purchased online, must be shipped overnight since they have such as short lifespan. With most retailers, plan on spending an additional $20 to $40 for shipping. If purchased online or locally, it will be sold in its raw form, often sold as is and will be shipped overnight due to the sensitivity of the product. To explain the taste of a white truffle, experts say it has a garlicky taste with a musky-like aroma. 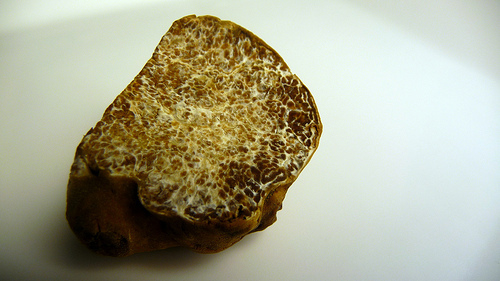 A white truffle, when prepared, isn’t meant to be consumed in its natural form; instead, it will be shaved paper thin and added to food such as pasta. They can also be gently sauteed in oil and butter while being served on bread. Fresh truffles should be consumed as soon as possible; however, if you need to store them, you can refrigerate for up to four days.